Movie audiences have something more properly resembling a summer movie weekend coming up, with three high-profile releases, two with A-list casting, along with (yet another) TV adaptation. Commercial prospects look bright for only two of them, however, and one of those two will likely start strong before fizzling out quickly. Still, the summer is showing signs of life and theaters should be full across the continent, with some very different audiences targeted with the various new releases. Scooby-Doo is probably the TV-to-movie property with the highest kitsch factor, so there's both an inherent reward and risk to going forward with it. The reward is in the pre-sold audience that basically guarantees one excellent weekend. The risk is that if you screw up, the fans who were so eager to see the film in the first place are going to bite back hard. In this case, it looks as though the latter is about to happen. Although the campaign for this film started out with the Batman parody teaser that showed just a hint of genius, it's been nothing but dire since. 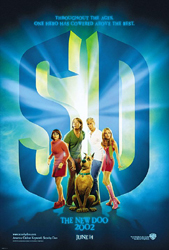 Early reviews would seem to confirm this suspicion, making Scooby-Doo a Scooby-Don't. Is that really going to keep people away? Probably not, since audiences have shown an amazing willingness to give a name-brand film a chance against all better judgment. The ultimate example here would be The Flintstones, where the only bright spot was the casting of John Goodman. That film was still the king of its Memorial Day weekend, earning $37 million in a four-day period. Despite this quick start, which was a Memorial Day holiday weekend record at the time, it was a relative flame-out, ending with just $130 million total. Not everything slips under the radar, however, and Scooby-Doo still has to fear a Rocky and Bullwinkle-style collective memory wipe (We all agree that never happened, right?). The casting here is again the only bright spot, with Matthew Lillard doing a spookily accurate imitation of Casey Kasem's Shaggy, and Linda Cardellini receiving praise for her Velma. Counteracting these performances are Sarah Michelle Gellar and Freddie Prinze, Jr., with the latter, according to some reports, having trouble playing wooden. Another negative comment is that it's not even playing the post-modern angle correctly (à la The Brady Bunch Movie), nixing the subversive fun for those who grew up with the cartoon. There's a method to this madness, however, as Warner Bros. has shifted the focus to the less-discriminating kiddie audience and had to cut hard to get that PG rating. This shift might have salvaged one weekend but won't get them much past it. A strong $33 million opening should be in store for the gang in the Mystery Machine, but it's jinkies after that. Matt Damon makes his action-star debut in The Bourne Identity, based on the Robert Ludlum novel. Damon had a much better 2001 after a trio of failures in 2000, although his one major role was in an ensemble film. Ocean's 11 did extremely well, although his part in it is worlds away from what he's asked to do in this film. He joins buddy Ben Affleck in the unlikely-action-heroes club, after Affleck's recent success in The Sum of All Fears. If it worked for him, why not Damon? Well, for one, while Affleck jumped into an already-established franchise, The Bourne Identity is the first of what Universal hopes will be a successful trilogy. While the amnesia plot point of the thriller might be termed slightly soap opera-esque, the broader paranoia theme of being hunted without knowing why makes for an excellent hook. This is Doug Liman's (Go, Swingers) first big-money studio project and hopefully, for his sake, he has made a convincing go of it. Its use of exotic locales (Do people in Zurich think of Chicago as "exotic"?) recalls the James Bond series, although obviously not to the same extent. Franka Potente of Run Lola Run fame is there to lend Euro credibility, but don't be surprised if this movie proves to be the stepping-stone to a leading lady career. Think Milla Jovovich with acting chops and some meat on her bones. A $23 million weekend makes sense, considering the pros and cons, with sequel hopes hanging in the balance of its performance in days ten to 12. John Woo brings his trademark blend of ultra-violence and cool style to the WWII film in Windtalkers, and I can't wait for the scene where Nicolas Cage charges the Japanese front line with a machine gun in each hand. Originally slated to appear in an Oscar run last November, it was delayed for marketing reasons, which is code for the fact that MGM wasn't happy with what they got. Nicolas Cage is all wrong for this, in my opinion, as his histrionic/narcoleptic style of acting may have been perfect for the nearly operatic Face/Off, but it just doesn't suit this material. The fame of John Woo will be put to the test with the release of this film; just how many noticed he was the man behind Mission: Impossible 2? Obviously, his famed hyper-real style can't be used here. Listen; I don't begrudge him trying different material, but was he really necessary for this film? There's also the issue of the studio of release, MGM, who seems to have squandered what little mojo they earned from last summer's Legally Blonde. This is the third release in the last four months from them that has been delayed in some fashion. Rollerball was chopped into little pieces and should have been chopped further; Hart's War was another similarly-themed war movie with an A-list star that practically debuted in repertory. This is a studio that has had exactly three non-sequel or remake successes since 1998 (Man in the Iron Mask, Stigmata, the aforementioned Blonde) out of 26 releases; you'd almost have to try to be that bad. At this point, the explanation of some kind of voodoo curse starts to look plausible (I've only been working the eyes). Whatever's causing the funk, I see nothing from Windtalkers to break it. A $14 million weekend will be followed by a struggle to reach $50 million total. The Divine Secrets of the Ya-Ya Sisterhood came close to nabbing a surprise first-place spot at the box office, and given the nature of its audience, I would not be surprised if it passed last week's number-one film, The Sum of All Fears. While Fears fell at a respectable-for-blockbusters pace of 38%, female-oriented films such as this one tend to shed viewers more slowly. A prime example is The Bridges of Madison County, which opened at just over $10 million but finished with over $70 million. I suspect the effect will not be as large, with cinema trends such as they are, but $85 million is not a ridiculous expectation at this point. Bad Company wouldn't get to that mark if you spotted it $30 million; its meager $11 million opening weekend will hopefully convince everyone to make Joel Schumacher stick to small, quasi-art-house films from now on. With recoveries from Star Wars and Spider-Man after the deflation of post-Memorial Day weekend, both those films resume their quests to march up the all-time charts. Spider-Man will pass the $380 million mark, while Star Wars languishes slightly behind, in all probability reaching 16th spot, passing Jaws, The Grinch and last year's Shrek. Spirit: Stallion of the Cimarron promises to be the leggiest (makes sense; it's got four) of all returning films yet again, at least until Lilo and Stitch comes and bursts its bubble. $100 million is still a remote possibility at this point.